Taboo Harley Davidson celebrated their anniversary bash with live entertainment, food, and fun. Motorcycle riders from all over the state (and some from out-of-state!) came to Alexandria to be part of the festivities. Neblett, Beard and Arsenault hosted a tent at the event and gave out water, snacks, T-shirts, cups and koozies to visitors. The firm set up fans to help people beat the Louisiana summer heat as they enjoyed the event. We also sponsored the stunt show, which featured stunt rider Christina Billings. She performed with great success Friday night and twice on Saturday! The crowd loved her performance, and she later stopped by the firm’s tent to thank NBA for our sponsorship. Over the course of the weekend, Taboo hosted hundreds of visitors who all enjoyed the live music, local food, and of course, motorcycles. 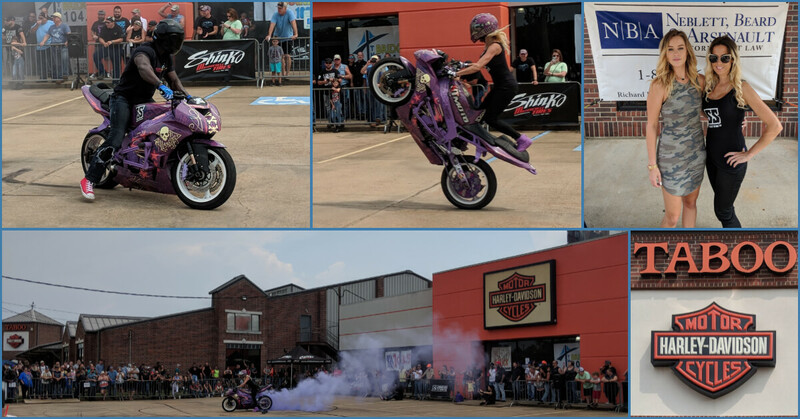 The anniversary bash brought together motorcycle enthusiasts of all ages to an event that was certainly unique for Central Louisiana. Taboo Harley Davidson was thrilled to have so many visitors over the weekend but made sure to remind everyone attending of the importance of motorcycle safety and wearing proper safety equipment. During her interview with On Point Talk, Amanda Marcum, marketing and events coordinator for Taboo, spoke about DOT-approved helmets and how they can be the difference between life and death if you’re ever involved in a motorcycle accident. NBA worked with Taboo Harley Davidson to remind visitors of the importance of helmet safety and encouraged those who visited the firm tent to give us a call if they had any questions about motorcycle safety or accidents. The event was a success, and the firm was pleased to support Taboo, Christina Billings, and their fellow motorcycle riders across the state.